Stricter environmental regulations and rising energy costs are forcing industrial wastewater treatment plants to ensure wastewater discharge compliance and at the same time make operations more energy efficient. One of the main areas for environmental and cost savings lies just below the surface of the biological tanks. 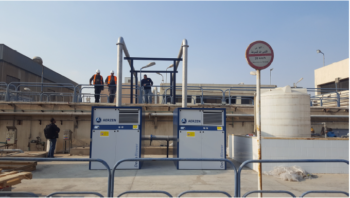 In aerobic wastewater treatment processes, aeration introduces air into a liquid, providing an aerobic environment for microbial degradation of organic matter. The purpose of aeration is to supply the required oxygen to the metabolizing microorganisms and to provide mixing so that the microorganisms come into intimate contact with the dissolved and suspended organic matter. 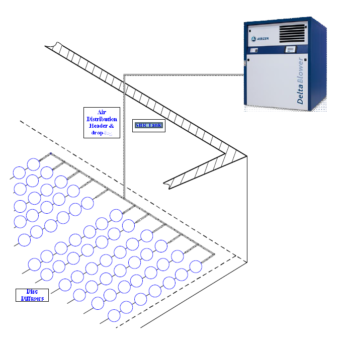 Aeration counts for 40-90% of the total energy consumption depending on aeration system design and arrangement. 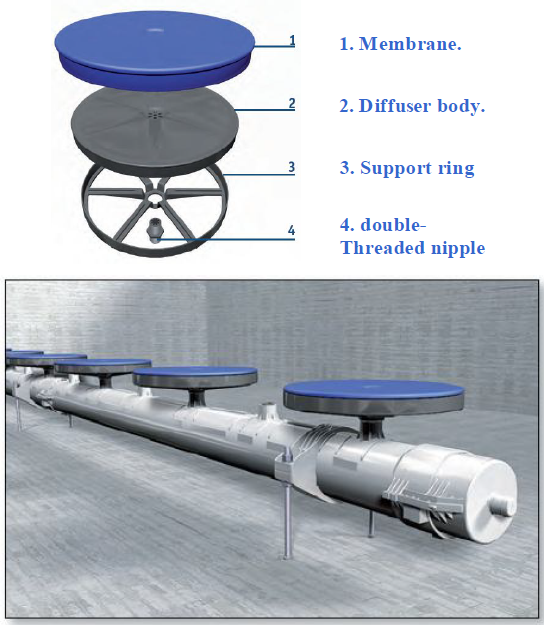 There is a wide range of equipment suitable for delivering oxygen to aerobic reactors in biological treatment. Aeration devices such as mechanical aerators and coarse and fine bubble diffused aeration systems, cover a large portion of aeration equipment installed at water resource recovery facilities globally. The aeration equipment selection process should consider system capacity, operation range, and equipment reliability. Chipsy is the leading international company in the potato chips & snacks industry. During the past few years; chipsy has managed to carry-out several upgrades to reduce water requirements and at the same time increase the production rate. And that resulted in increasing the organic load concentration in the waste water, leading to necessity to attain optimization and upgrade of the aeration waste water treatment system, in order to enhance the treatment process and be able to handle the high organic load concentrations, while preserving the increase in the production rate and water savings. 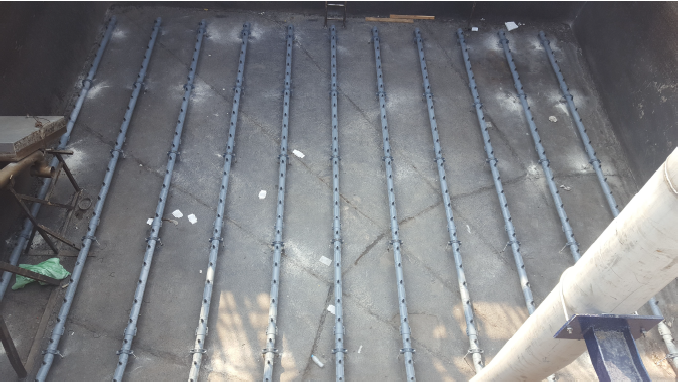 It was required to increase the Standard oxygen Transfer Rate (SOTR) of the Sequencing Batch Reactor (SBR) aeration tanks from 80-100 (kg O2/hr) to 160-200 (kg O2/hr). In the Old wastewater eration system, Jet Aerators were used to deliver oxygen in the Sequencing Batch Reactor (SBR) tanks. 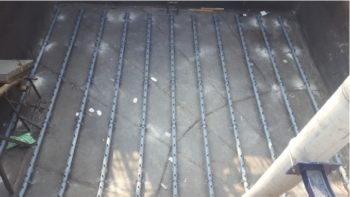 There are two scenarios to fulfil the required upgrade, by doubling the number of het aerators in each of the two SBR jet aerated tanks, and utillizing the new advanced aeration system engineered and commissioned by PuriChem Integrated systems and PPU-Umwelttechnik GmbH for the other two SBR Tanks. Each of the two jet aerated SBR tanks was equipped with two Flygt Jet Aerator(s); these aerators inject air into the throat of a Venturi to create fine bubbles in order to deliver oxygen to aerobic reactors. 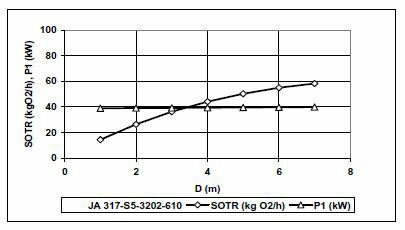 According to the performance curve of Flygt Jet Aerator(s); the single jet aerator is able to deliver oxygen with a Standard oxygen Transfer Rate (SOTR) of 50 (kg O2/ hr) at 5 (m) water depth, with an absorbed power (P1) of 40 (kW). 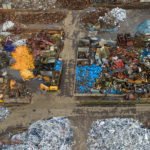 PuriChem Integrated systems along with their German Partners PPU- Umwelttechnik GmbH designed new advanced industrial wastewater aeration system to replace the old jet aerated system. 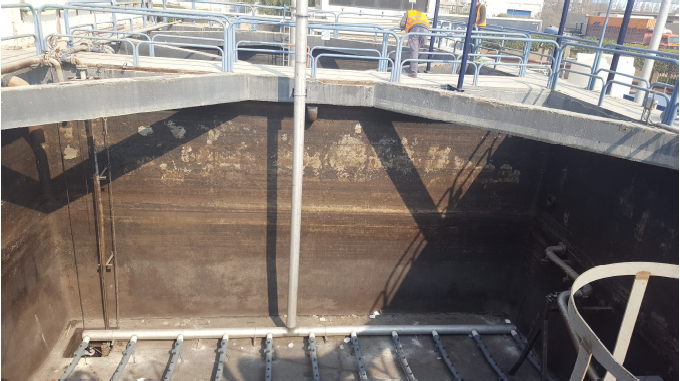 The new industrial wastewater system has been applied to Two of the Four SBR aeration Tanks. Air Distribution header and drop-leg. Fine Bubble Disc Membrane Diffusers. The industrial wastewater sytem is designed to deliver fine bubbles at a wide range of air rates. By insuring an even bubble distribution. The positive displacement blower is extremely robust with a compact design, and being installed above the ground had a great impact on lowering maintenance requirements and making the access, operation and monitoring of the apparatus very easy. 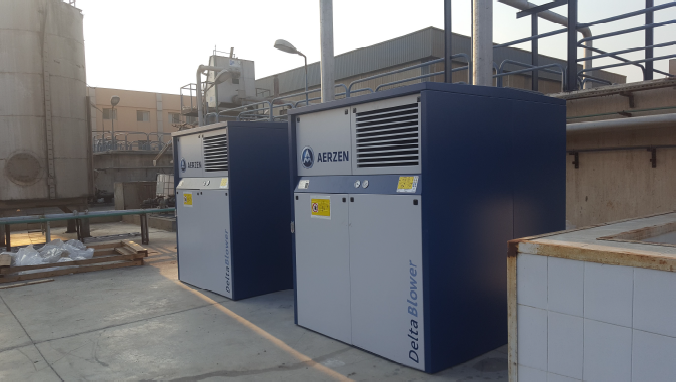 Using (Variable Frequency Drive) VFD Improves the efficiency of the blower by matching speed to changing load requirements, allowing accurate and continuous process control over a wide range of speeds, and also eliminates the initial power surge and mechanical shock of switching the motor from ‘off’ to ‘on’, and extending the service life & lowering the maintenance requirements and costs for the blower and also for the downstream equipment. The stainless steel air distribution header and drop-leg, distributes air generated from the blower to the air diffusers located in the bottom of the aeration tanks. 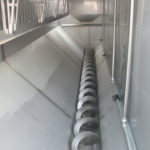 The air distribution header and drop-leg are made completely from stainless steel to diminish the friction losses to the minimum, and allow for better cooling before entering the SBR Tanks. The Fine bubble Disc membrane diffusers play an important role in maintaining a high oxygen transfer efficiency over time. They provide an outstanding chemical resistance and durability as well as reduced surface fouling. [*]The stated value is in case that; the jet aerators are performing at 100% of its efficiency. 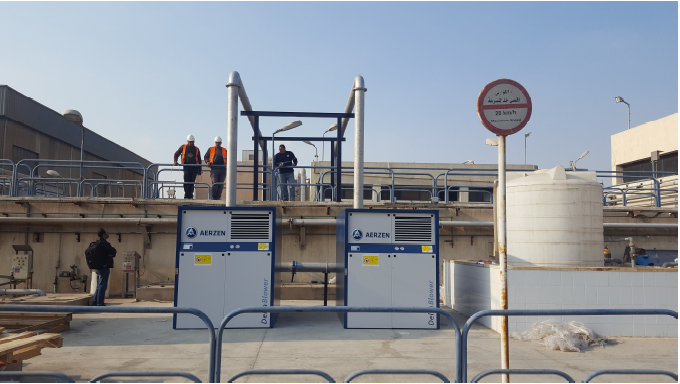 The advanced integrated industrial wastewater aeration system designed by PuriChem and PPU was able to save power requirements with a value of 180 (kWH), and while the aerators are operating 16 (hr/day), the new aeration system will save up to 683,280.00 (EGP/year). [**] in comparison with the old wastewater aeration system. [**]The prices are as of January 2017. The maintenance cost of industrial wastewater jet aeration system is nearly 150,000 EGP/year for the single jet aerator, so if the first scenario was applied the maintenance cost of all SBR tanks jet aerators will be 1,200,000 (EGP/year) while the maintenance of the new advanced aeration system is 100,000 EGP /year. The new advanced system is very easy to access & maintain unlike the jet aerators which are totally submersible in water. [****] Aeration process operation hours is 16 hr/day.